i bought the game in steam early access but get an error when linking to the account. I'm sorry to hear that you're having difficulty linking your account. We've been looking into this. It appears that something changed in the linking process and we don't have an ETA yet for fixing it. However, you should still be able to play in Production as normal while we work on the issue. We are in the process of updating the Steam linking system, but I don't have an ETA on it at this time. The current version on Steam is the same version you can download here, so aside from the achievement you're not missing any gameplay. Our distributor, Little Orbit, will be announcing the release details for the update in the coming months. 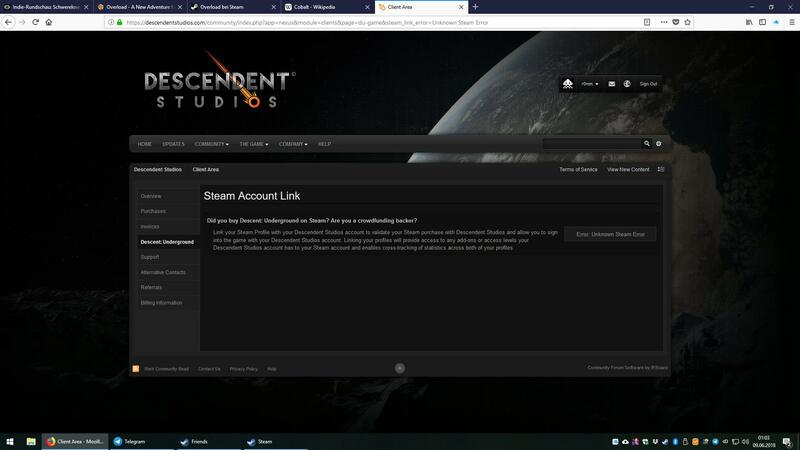 I linked my steam account to descendent studios but the achievement did't work..
Also having this issue. Some guidance would be nice as I'm not sure how else to download and play it?